As we embrace the new year, we always like to reflect on what the past year has brought us. Many of us know that the Saskatoon Real Estate Market has seen many struggles throughout the year. We have also seen the sales dollar volume decrease by over 8% which tells us less higher end homes are selling. The amount of new listings also saw a large decline of 11%, this has been a huge factor in keeping our inventory levels reasonable in this trying market. Unit sales saw a decrease of 5% over last year which is a result of less people having enough equity in their homes to move on to their next place. 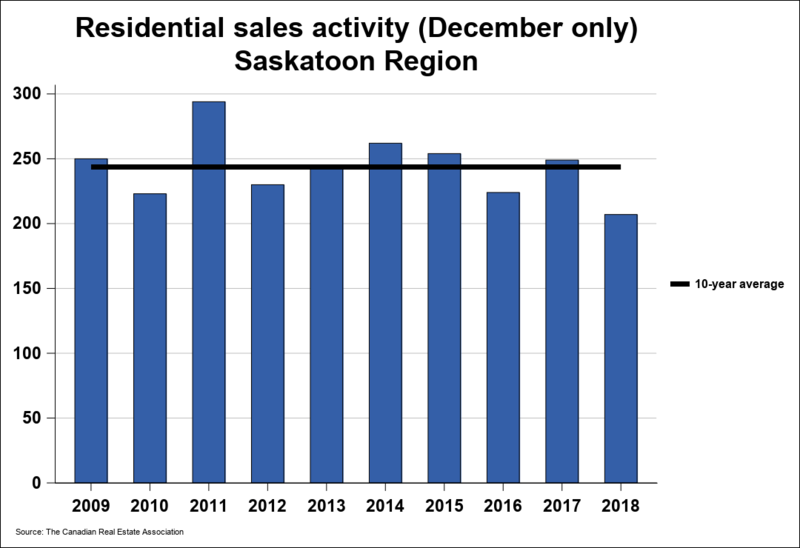 Unfortunately, 2018 marks the 4th straight year of declining annual sales in Saskatoon. With all this negative news, most of our clients have had many questions regarding what’s the best case scenario for their situation. Each case is unique and always depends on what their current needs are and why they’re moving. These conversation usually start with what market value is and how much equity they have in their current home. When equity exceeds the past downward adjustments in housing prices most can handle the recent stress test, the rate increase and can trade in the current market. On the other side, we continue to see many people trying to test the market at a higher than market value price and are just not getting the results they’re hoping for. In our current market people have to be realistic and price accordingly. The market will recover but it will take some time. Keep in mind if your property has decreased in price, the next home you are buying has decreased just as much on the same percentage scale. This makes it a great time to trade up. As of right now in 2019, inventory levels are quite low but this will increase as we move closer to spring. Most sellers will wait for the weather to change before they list their homes. Although if you are considering selling, you might want to list before the spring market. By doing this you will have less homes to compete against. Also with the talk of another increase from the bank of Canada and the uncertain economy we expect it to be another trying year across the Province. We will continue to see activity across the whole market just on a smaller scale than we are used to. If you need help buying or selling our team is here to help!